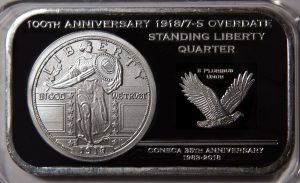 That CONECA produced a quantity of no less than 50, but as many are needed after offering, to our membership, examples of 2013 Silver Eagles containing a second strike on them from our CONECA Logo die. The exact quantity minted will be determined by the number of orders received within 45 days after the mailing date of the Errorscope containing the offer to our membership which will include a moderate excess minted for anticipated “late orders”. They will be offered via listserve where they may be ordered with a printable order form or via PayPal, on our website home page, through E/S and through a Press Release sent to Coin World, Numismatic News, etc. Members and nonmembers alike may order them (as was past policy on medals). Jim Motley will create a page with PayPal buttons in order for them to be ordered in this manner to be posted on the web site after Ken Potter comes up with an outline of a one line order form. Al Raddi with handle accepting and processing the orders. He will place each coin in a flip with a special insert indicating they mere made to celebrate our 30th Anniversary along with a thank you letter. Al Raddi and Ken Potter will be reimbursed by the club for any expenses incurred by them such as for postage, mailer bags, flips, etc. The coin/medals will be offered for $65 each with a postal cost of $3.99 for the first coin and $2 per coin for any amount ordered beyond the first coin. All funds taken in will go to the general fund. Prices may be adjusted if there is a significant increase in the price of silver for any remaining inventories. Have a CONECA reverse die made rather than rent a generic die for the 30th anniversary medals. Have it created to be similar to the one used for the 25th anniversary. The costs would be $300.00 (or $275 if we supply the finished art). [T]o accept the nominations of Jim C and Fred W as submitted for the induction to the CONECA Hall of Fame to the BOD, with vote to follow. Motion: by Rick Emery (7/26/2012) seconded by Jason Cuvelier [M]ove to close the nominations for the 2012 Lyndon King Award being awarded to Mark Lighterman. To propose a limit of $300.00 for the purchase of an error coin plus the cost of the trophy and that the person holding the board seat that this falls under have the authority to purchase an error coin that he/she sees fitting. We leave the membership dues as they currently are listed. To add David Harper for NN and CW (person to be determined later) for a “regular” Honorary Membership with a hard copy of E/S being delivered, plus David Lislot (www.CoinWeek.com) at dlisot@cointelevision.com, Wayne Homren (E-Sylum) whomren@gmail.com and James Bucki at coins@aboutguide.com of the New York Times’, website www.coins.about.com to be added as “Online Only” Honorary Members. 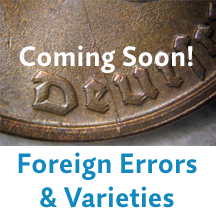 That the ANA Library, CONECA Library, COINage Magazine, Numismatic News and Coin World all be give an Honorary Memberships, which includes a hardcopy version of Errorscope to be mailed to the appropriate entities addresses to be determined by the Membership Chair. Further, that David Lislot (www.CoinWeek.com) at dlisot@cointelevision.com, Wayne Homren (E-Sylum) whomren@gmail.com be added as “Online” Honorary Members with access to the Online version of Errorscope (since their coverage of us occurs online). 1) We honor the contributions of the Jean Cohen collection and book donated to the club, (of which the rights to her book are now owned by CONECA), by having the book scanned into a format that can be used by CONECA Members. Until this is done the collection will remain in the possession of CONECA in the event that coins from the collection are needed by those working on the conversion process. At the point the collection is no longer needed for this project the board will decide if and whom will have access to it to do further cataloging and research. 2) That we continue unchanged the current dues structure for Membership in all categories as recommended by Membership Chair, James Motley. 3) That we continue unchanged the current fees structure for the CONECA Examinations/Attributions Program as recommended by James “Rick” Emery. [W]e change the name from CONECA to CONECA Inc.
[M]ake the motion to nominate and support the candidacy for President of the ANA of CONECA member and supporter Walter Ostromecki. He is currently serving as Vice-President of the ANA and has been a strong supporter of CONECA, especially on the West Coast of the United States for many years. At present, Walter is the only candidate for ANA President. Additionally, this motion was to nominate Mike Ellis to the ANA board. The CONECA Board of Directors approve a budget of $860 for awards and recognitions in 2013. CONECA receives a generous donation from Jean Cohen of assorted numismatic books. The Board explored, and is continuing to explore, various avenues on how to best make use of them. 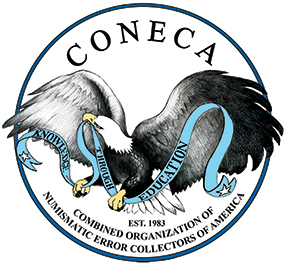 Section 1: This organization shall be known as Combined Organizations of Numismatic Error Collectors of America (CONECA). No part of the net earnings of the organization shall inure to the benefit of any member, trustee, director, officer of the organization or any private individual (except that reasonable compensation may be paid for services rendered to or for the organization), and no member, trustee, officer of the organization or any private individual shall be entitled to share in the distribution of any of the organization’s assets on dissolution of the organization. No substantial part of the activities of the organization shall be carrying on propaganda, or otherwise attempting to influence legislation (except as otherwise provided by IRC 501(h) or participating in, or intervening in (including the publication or distribution of statements), any political campaign on behalf of or in opposition to any candidates for public office. purpose, subject to the approval of a Justice of the Supreme Court of the State of Delaware.